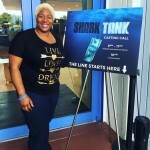 Shark Tank Casting I had an amazing time auditioning for Shark Tank in Miami, Florida. The entire staff of the hit ABC Show, Shark Tank, was utterly amazing, friendly, and comical. Like many in attendance, I stood in line eagerly awaiting my opportunity to pitch my business to Shark Tank’s producers. While waiting, I was able to mingle and mix with other budding entrepreneurs and check out their cool products!..